How do people get started volunteering for Caritas Japan? People find out about volunteering with Caritas through the internet or from friends. 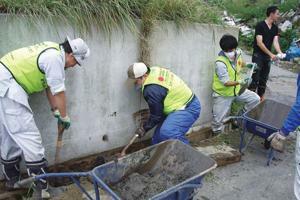 Staff at our centre in Sendai talk to them and then place them in one of the tsunami-hit areas. They usually stay five days to a week. During summer vacation, we had many students. Now it’s autumn, we have more people in their 30s and 40s, and people over 60. We clean up debris, distribute supplies, run soup kitchens, clean salvaged photos, and basically respond to any needs raised by the communities. As their needs change, we do different things. For example, when they lived in evacuation centres like school gyms, we set up hot water stations for soup, since they didn’t have hot water. Now that they are moving to government-built temporary housing, they will need help to get through the long winter. What is a typical day like for volunteers? The volunteers sleep on the floor at Caritas “bases,” which are often church buildings. Here in Kamaishi you see about a dozen young women are in this big room in a rectory, and over there is the room for men. They wake up at 6 and have breakfast. At 7:45 we meet to discuss the day’s schedule. If we’re doing clean up, the volunteers put on gear, like hard hats and rubber boots. A little before 9 a.m. we head out to work. Which item of gear is most important? The helmet is the most important thing if you’re working inside, because debris can fall on you. Outside, the gloves and boots are most important. The volunteers bring their lunch and have it at noon. Around 3 or 4 they come back to the Caritas base, shower, and wash their clothes. Cleaning the tsunami debris is hard—the volunteers come back sweaty and dirty and tired, with mud on their boots and torn clothes. What are some other challenges the volunteers face? That is terrible. How do volunteers cope? Actually, many volunteers get hope and courage from volunteering. Young people who can’t find work come here to volunteer and feel they are needed. They go back energized. You’ve attracted volunteers from many faith groups. Why do you think that is? Caritas has Christian and Buddhist volunteers. They respect each other’s humanity and religion. They work well together. Our purpose is the same. The volunteers have set up “cafes” where people can receive donated relief items like noodles. But the survivors can also sit and talk while they drink tea. Why are these cafes important? People are traumatized and stressed. They need someone to listen to them. That’s why Caritas trains volunteers to in grief care, so they can really listen to what the survivors say. Why are they called “Philia” Cafes? The third time Jesus asked Peter, “Do you love me?” he used the Greek word “philia” for love. That’s why I chose “Philia” as the name of our cafe. This work is what the gospel tells us to do. It’s about compassion and doing what the Bible says. When I see the tsunami survivors doing better, their happiness is my happiness.